Illuminated globe with black oceans. Constellation on earth. 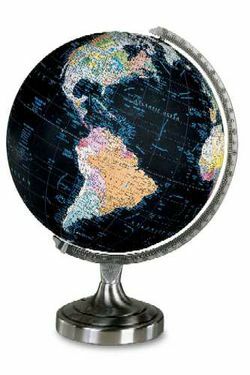 The black ocean globe may have a heavenly appearance, but it shows the earth’s expanse. The Orion’s 12" diameter sphere and antique pewter finished, solid steel base, and die-cast semi-meridian make it perfect for any desktop. And just as Orion blazes in the night sky, this Orion lights at the flip of a switch — a perfect feature to set a nighttime mood.